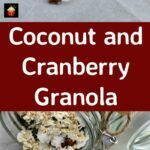 Coconut and Cranberry Granola! This is a really lovely easy recipe. 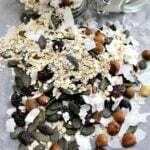 Here, I’ve chosen to add some hazelnuts, coconut, dried cranberries and pumpkin seeds to the mixture. I think the combination is really delicious. Of course, you can also swap out some of the ingredients for say, walnuts, pecans, raisins, dried apricots. 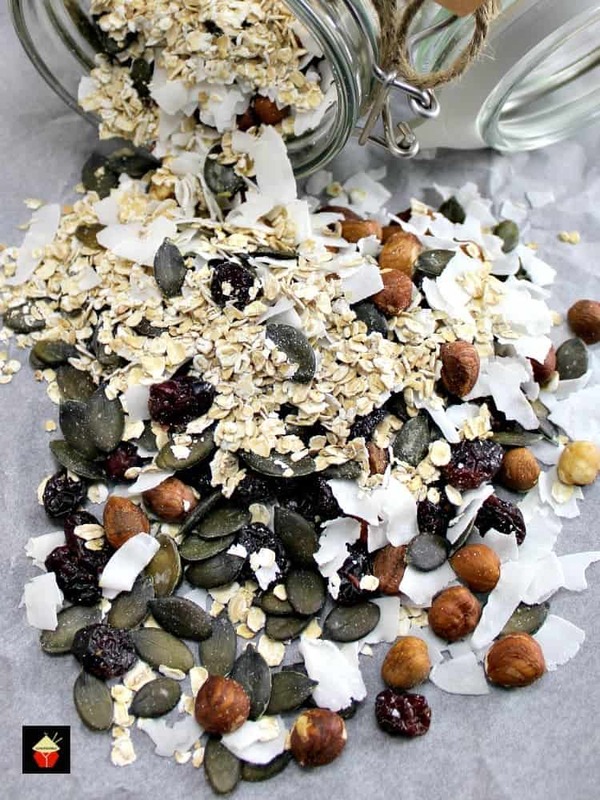 At least that way, if you are making this as a regular breakfast in your house, you can swap and change each time you make a batch so it’s always like new for you! In the photos, I actually decided I would make up a couple of jars to give as gifts over Christmas time. I bought some large Mason Jars from my local shop and simply gave them a good wash in the dishwasher, then layered the ingredients EXCEPT the honey and oil. Closed it and added a tag on the jar with some simple instructions for the recipe. My friends really loved their gifts so that made me very happy! Served with some nice yogurt it makes for a simple and quick, yet very wholesome and delicious breakfast. So have a try of this recipe. Don’t be afraid to make it your own by adding or swapping some of the ingredients to your liking. It’s fun to experiment so give it a go! 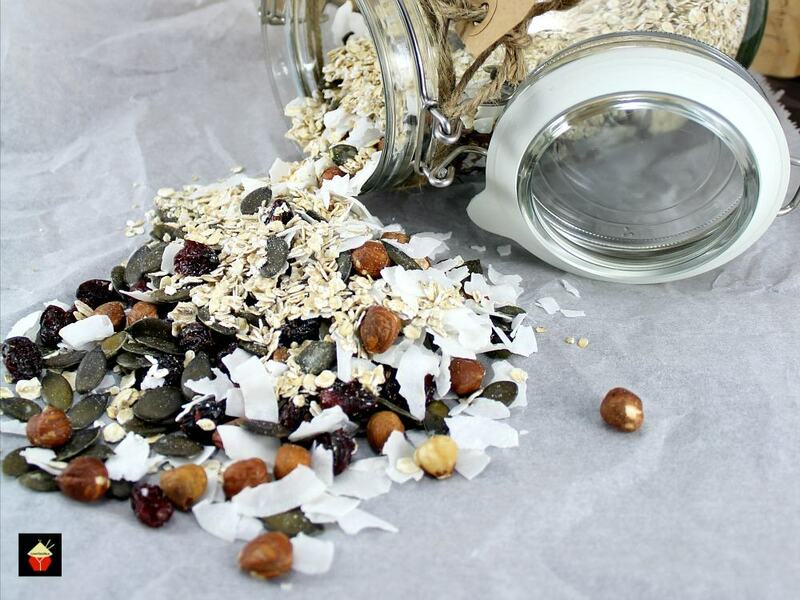 NOTE: You can swap the hazelnuts, cranberries etc for pecans, walnuts, raisins, dried apricots etc. 1. Heat oven to 325 F or 170 C. Line a baking tray with parchment paper. 2. Roughly crush the hazelnuts (or you can keep whole) then add to a bowl together with the honey, oil, oats and coconut. Combine well with a spoon. 3. Evenly spread the mixture on to the baking tray and place in the oven for 30 minutes. Half way through baking, take a fish slice or spatula and turn the granola over on the tray and return to the oven for the remaining 15 minutes. 4. Remove from the oven and allow to cool completely for around an hour. 5. When completely cooled, mix in the cranberries and pumpkin seeds then store in an air tight container. This will store nicely for around 2 weeks. Heat oven to 325 F or 170 C. Line a baking tray with parchment paper. Roughly crush the hazelnuts then add to a bowl together with the honey, oil, oats and coconut. Combine well with a spoon. Evenly spread the mixture on to the baking tray and place in the oven for 30 minutes. 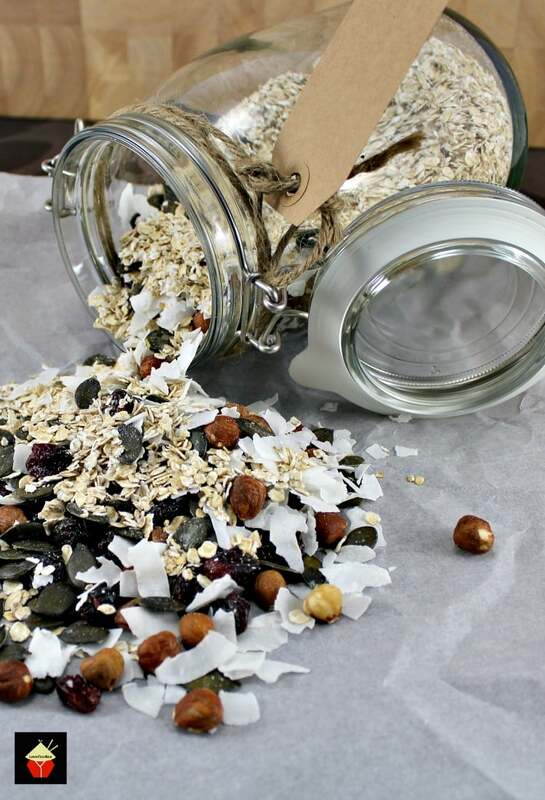 Half way through baking, take a fish slice or spatula and turn the granola over on the tray and return to the oven for the remaining 15 minutes. Remove from the oven and allow to cool completely for around an hour.